I grew up on a farm. Now, I can’t speak for all farms, but I can speak to my experience. When you have a lot of barns and outbuildings on the family farm, it’s easy to put stuff in these buildings because you might need it someday. That’s not hoarding. That’s, uh, that’s being practical. Waste not, want not. That sort of thing. I can also fix almost anything with baling twine, but that’s a farm story for another day. When the Junk Whisperer (aka my stepmom) came into the picture, she started unearthing these long forgotten treasures while cleaning out the farm’s outbuildings. Thanks to her hard work and ingenuity, I have the BEST table makeover to share with you today. It’s 90% the best because it’s a super high-end looking makeover and 10% the best because I didn’t have to do any of the work. Ha! It all began with this lovely peach table the Junk Whisperer found somewhere on the back forty. This table is a good reminder to not be distracted by the obnoxious or dated elements of a piece of furniture. You have to look past all of that. Check out the legs! Admittedly, it can be tough to do when this is staring you in the face. The table was perfectly awesome in its time, but that time has come and gone. The Junk Whisperer removed the peachy, checkerboard top to make way for a new, living edge table top made from a wood burl. It’s actually a growth on a tree that signifies the tree has undergone some type of stress caused by an injury or maybe a fungus. Usually the burls are underground and attached to the root system, but sometimes they grow on the tree trunk. When they do, they produce magnificent and highly valuable wood. The photo above shows two slices of burl wood. The top slice has the bark attached. The bottom slice is what the burl looks like if you pick all of the bark off. Pretty amazing, right? Nature’s artwork is the absolute best. Yes, the Junk Whisperer picked all of the bark off the burl to reveal that cool texture. The burl, which was also found in one of the farm’s outbuildings, was cut into slices by a friend. Unfortunately, or fortunately depending on your outlook, the saw left some tool marks on the slices. The Junk Whisperer did her best to sand the burl slice smooth. After that, she sealed the slice with a few coats of a clear polyurethane and attached the burl to the table base with screws. The poly brought out the warmth in the color of the wood slice. I brought the table outside in a quest to find natural light, but here’s how it looks (before it was styled) in the house. My initial thought was that it looks like a table that would cost several hundred dollars in a high-end furniture shop. That opinion hasn’t changed. Yet, the Junk Whisperer made this table over for free (not counting the can of poly). That table base sure looks different now with the burl wood top, doesn’t it? 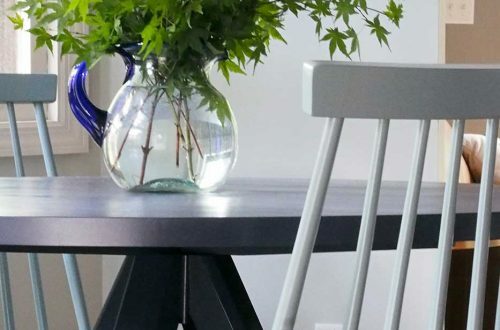 The Junk Whisperer incorporates natural elements and tones into her decorating, so this table fits in perfectly. She was pretty happy with how it turned out. I was like, “WOAH! NO WAY! THAT LOOKS SO COOL! IF IT DISAPPEARS I DIDN’T TAKE IT!” I’m subtle like that.